Goldwell strives to set standards for professional hair care throughout the world. 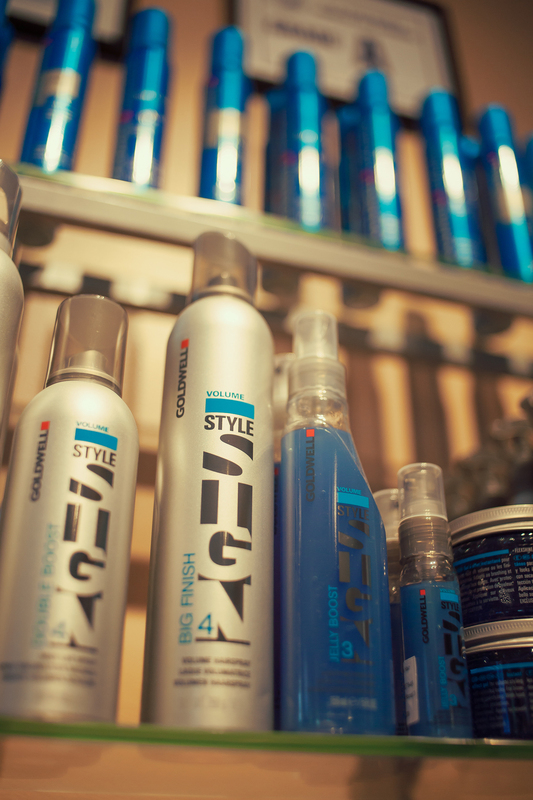 From the essential to the creative, Goldwell Hair Products has everything you need to create amazing, durable styles. Style Sign includes 4 different styling segments Texture, Volume, Straight, and Brilliance Gloss for each hair type and 5 levels of hold to create the look you want. The luxurious Goldwell Inner Effect hair system will repower and resoft your hair to a lively, new look! There is also a goldwell mens line called Goldwell for Men, and a Dualsenses line Ultimate Color Protection & True Color Dualsenses Green. KMS goes beyond reinventing style and rebuilding the hair structure. All KMS haircare products contain natural, organic and biodegradable, plant-derived ingredients and are naturally pH-balanced. KMS Hair Care Products are cruelty-free and VOC compliant. KMS has 9 segments, Tame Frizz, Curlup, Add Volume, Moist Repair, Silk Sheen, Hair Play, Color Vitality, Free Shape, and Hair Stay. The secret to beautiful hair is the sea. Aquage is professional, prescriptive hair care. We custom blend each formula, carefully selecting the most potent and effective sea botanicals to deliver ultimate results. Aquage has targeted solutions to enhance or transform virtually any hair texture. Our complete line of Priming, Styling, Texturizing, Thermalizing, and Finishing products are designed and tested by hairdressers, on the stage, and in the salon. From our hands, to yours. Aquage. The first haircare system that is able to suspend a functional dose of Omega-rich oils within a water-based system and infuse them into the hair. Ultra-gentle formulas have NO sulfates, parabens, gluten or sodium chloride. Replenishes hair’s depleted natural oils, infusing vital moisture and brilliant shine. Repairs damage for maximum strength and elasticity. Renews the healthy look and feel of color-treated hair. Therapro is an amazing new product designed for both men and women that is specially formulated to help stop thinning hair. Therapro has been researched and developed by leading dermatological scientists who specialise in treating scalp, skin, and hair loss conditions. Therapro is FDA approved and clinically proven to help treat dandruff, psoriasis of the scalp, seborrheic dermatitis, fungi, and bacteria associated with hair loss. Pretty Baby Soaps are cruelty-free, using no animal fats, preservatives, or dyes. Their products are made with natural products like butters, spices, essential oils, sweet milk, goat’s milk and buttermilk and fortified with Vitamin E, Saponified Olive, Palm Kernel, and Coconut oils. This makes a luxurious, thick, rich, lather that is dense and penetrating, with character and richness in every bar.